These aren't just for cases of idle munchies. These bars have a mission: to annihilate your hunger. 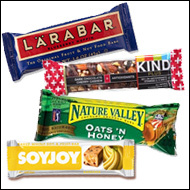 Fruit 'n nut bars like those by Larabar and KIND hold up well on the go and taste awesome. We especially love Larabar's Blueberry Muffin bar (190 calories and a PointsPlus® value of 5*), and the KIND Plus Dark Chocolate Cherry Cashew + Antioxidants variety (180 calories and a PointsPlus® value of 5*) is ridiculously good. Crunchy granola bars (like the twofers sold by Nature Valley) are a smart choice, and the reformulated Soyjoy bars are REALLY DELICIOUS. Banana Soyjoy is the best and has just 130 calories and a PointsPlus® value of 3*. Yes! Cheese can be a bit tricky to travel with, and it shouldn't be thrown into your bag and left there for DAYS. But if you're just out for the day, cheese can go with you. It's a good source of calcium, protein, and other good-for-us stuff. Mini Babybel Light (by our pal The Laughing Cow) is AMAZING... and not just because the red wax it's wrapped in is fun to play with. That protective wax also makes it a super-travel-happy snack! 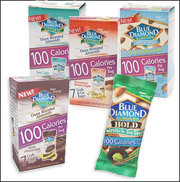 Only 50 calories and a PointsPlus® value of 1* per piece. 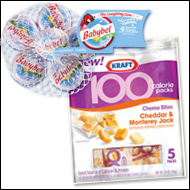 Two picks for shorter excursions are light string cheese (50 - 60 calories and a PointsPlus® value of 1*) and Kraft 100 Calorie Packs Cheese Bites (PointsPlus® value 3*.) Go, cheese! Sometimes it's not about needing to be filled up -- it's more a matter of eating something "not so bad" to keep you from indulging in high-calorie items. We like 100-calorie bags of lightened-up chips to keep us from inhaling fatty crisps, French fries, and other greasy stuff. Kettle Brand Real Sliced Potatoes are the best non-fried chips around. And we're THRILLED that some of the brand's flavors come in 100-calorie bags. And then there are always Popchips, which seem to be EVERYWHERE these days... That makes us super-happy! 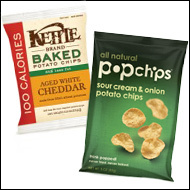 A serving of Popchips (about 19 - 22 chips) has 120 calories and a PointsPlus® value of 3*. Yum! A no-brainer? Perhaps, but since most people don't eat enough fruit and veggies (SPOILER ALERT: the next category in this list is veggies), it bears mentioning. 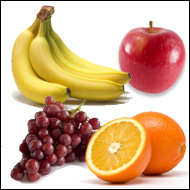 Fuji apples are a perpetual favorite, bananas are good grab-n-go picks, oranges work well (since they practically come in their own cases), and tossing a bunch of grapes into a baggie or sealable container is always a nice, simple snack. Another plus? All fruit has a PointsPlus® value of 0* per serving! It's easy to say, "Cut up veggies! Snack on them!" But then comes the response, "Hungry Girl! I like veggies but don't have time to chop 'em every morning." We get it... for real. But instead of just NOT eating veggies, find choices that require less prep -- cherry tomatoes, snap peas, baby carrots, or even pre-cut broccoli florets. 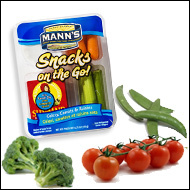 Mann's Snacks on the Go! pair up different veggies with dippers for you busy little bees. Jerky is arguably the original emergency food. Nothing travels as well -- the trick is to find the best-tasting options to chew. Our favorites? Healthy Snackin's Simply Snackin line is pretty much the best jerky in the world, but options by Jack Link's (the Premium Cuts Chicken Nuggets RULE) and Oh Boy! Oberto are terrific. Not a meat eater? Go for Primal Spirit Foods and Tasty Eats meatless jerkies. (Just steer clear of Tasty's chicken-flavored options; not as good.) 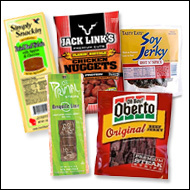 Most of these jerkies have 40 - 80 calories per serving and a PointsPlus® value of 1 - 2*. You need them. Because sugar cravings are like the IRS: Avoid 'em all you like, but eventually they'll catch up to you. So it's best to deal with cravings right away. 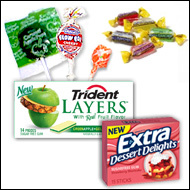 Top treats to keep on hand are lollipops (Mini Tootsie Pops and Dum Dums are some of the best, with 25 calories or less and a PointsPlus® value of 0 - 1* per pop), sugar-free gum (try sweet kinds like Trident Layers or Extra Dessert Delights), and -- at the risk of sounding like your Aunt Mildred -- hard candies. Hey, you can have three Jolly Ranchers for 70 calories and a PointsPlus® value of 2*. Not too shabby! Shhhh... Do you hear that? Your co-worker's stomach is growling! Click "Send to a Friend" to save the day with these snack picks.